Opening our students’ eyes to the future through the opportunity to learn from university students and lecturers. As our students make progress with their research projects, they naturally become interested in learning at a higher academic level. Therefore, we invite both students and lecturers from a wide range of universities to host academic workshops for our students. 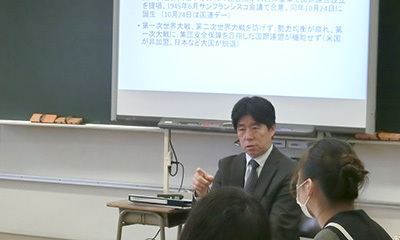 Dr. Yasuhiro Ueki, a former UN spokesman presented a lecture on “How the UN deals with global issues.” He explained the workings of the UN in the context of his own experiences in Namibia and East Timor. Dr. Takuya Hayashi, who specializes in the post-war economic relationship between Japan and Asia, presented a lecture for our SG class students. Every year, there are also workshops hosted by university students. 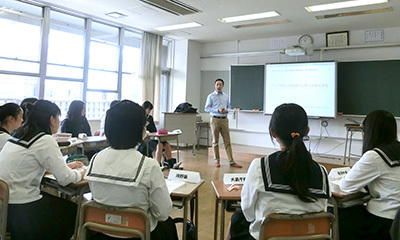 Keisen University is a pioneer in the area of international fieldwork projects for students. 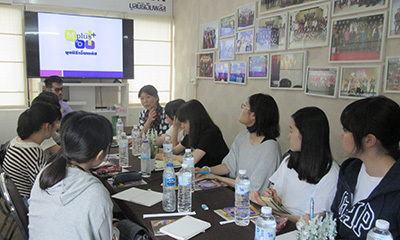 Our SG class students benefit from the support of Keisen University’s lecturers when carrying out their Thai fieldwork. ©2018 Kosei Gakuen Girls' Junior & Senior High School All Rights Reserved.